Ben Tucker is a teenage hacker going after the wealthy and corrupt, fighting bullies, and living in his father’s basement. When a mysterious alien attacks a space station conducting secret experiments, Ben is accidentally exposed to extraterrestrial technology and imbued with nuclear-based power. Now Ben Tucker is a fugitive from the police, an alien menace, and a paramilitary division hunting him down, with the intention to capture…or kill. It’s been twenty-five years since we’ve seen Solarman, but the comic originally published by Marvel and written by Stan Lee returns courtesy of writers Joseph Illidge and Brendan Deneen, artist N. Steven Harris, and publisher Scout Comics. 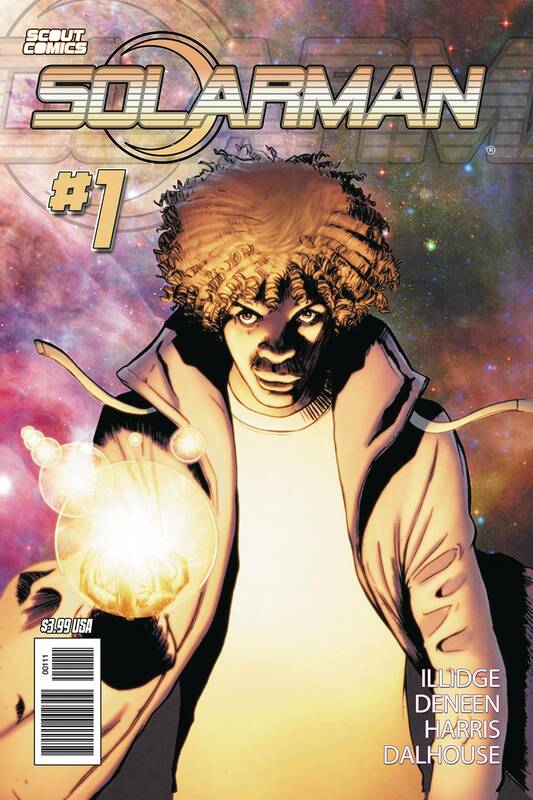 Solarman #1 introduces us to Ben Tucker a teenager who is imbued with power in what feels like a modern day update to the classic teenage superhero story. That modern update is one of the strongest things about this debut. It feels real and grounded in a world we can all relate to. Tucker is a teenager that many of us know. His home and neighborhood is one we’ve lived in or know of. This isn’t the “real world” in awe of fantastical beings where average joes attempt to find their place in it all. This is the “real world” in which the fantastical person is going to try to find their place instead. There’s a difference between the two and it’s an important one. Illidge and Deneen are focused on relatable characters that feel like we could know them first and foremost and that person is thrust into something greater. That grounded relatable feel to it all is helped by N. Steven Harris who provides a character and location that feels like a place we could live. Tucker and the other characters wear clothes we’d expect. Everyone looks like normal people you’d find on the street. It looks solid and most importantly diverse like the real world. Whether it’s in the script, Harris creates a cast that isn’t all one race or another, it’s a bit of everyone. Solarman #1 is a solid debut and I can’t wait to see what comes next. The issue is an exciting start and fills a much-needed niche that other publishers woefully ignore. This is a superhero comic for the masses and hopefully the masses find it, cause it’s solid. If you’re looking for a superhero alternative from the big 2, look no further.